1. The copies of Show Me How! Build Your Child’s Self-Esteem Through Reading, Crafting and Cooking that are being donated to libraries across the country were mailed out earlier this week. Four went to Florida, three to California, two to Maine and Illinois and one each to New York, New Jersey, South Carolina, Iowa, Colorado, Pennsylvania and Virginia. At least ten of the people who nominated their libraries were sent an additional review copy of Show Me How! . Many thanks to all of you…I really appreciate your willingness to read through the book and review it!! !I’ll let you know when the reviews will be up on their blogs. Try the “Passport Project”. This is a great summer activity. Make a “passport” from construction paper and talk about local “hotspots” you can all visit. Each page of the passport book will be devoted to one of those places…zoo, museum, art gallery, national park, landmark or forest, factory (take a tour), etc. After the visit, kids can write a short story and draw an illustration (or paste in a photo). Parent or teacher can stamp each page (like a visa stamp) and when the book is completed, a special treat or prize is awarded (bowling, dinner at a fancy restaurant, new clothes). If you have some good suggestions, please do share. The summer is almost upon us and I know it is difficult to keep kids in a learning mode…but it is important to continue some of the educational activities and routines…otherwise they take two steps back during the summer. Friendships are very important to kids. Studies done recently indicate that kindergarten children (especially boys) benefit from close positive relationships with other children their own age. Parents can help by arranging supervised playdates and by attending library story-times and other community programs where young children have the opportunity to socially interact. Moving disrupts those important friendships and most children are not enthusiastic about moving to a new neighborhood and attending a new school. However, moving is a necessary part of many children’s lives. Books for boys, common childhood experiences (moving), expressing emotions (anger, fear, anxiety), moving, pets. “They can’t make me pack my baseball mitt or my I LOVE DINOSAURS sweatshirt or my cowboy boots. They can’t make me pack my ice skates, my jeans with eight zippers, my compass, my radio or my stuffed pig. My dad is packing. My mom is packing. My brothers, Nick and Andrew, are packing. I’m not packing. I’m not going to move! Alexander is not going to leave his best friend Paul. Or Rachel, the best babysitter in the world. Or the Baldwins, who have a terrific dog named Swoozie. Or Mr. and Mrs. Oberdorfer, who always give great treats on Halloween. Who cares if his father has a new job a thousand miles away? Alexander is not — Do you hear him? He Means it! — going to move. We are all creatures of habit…and most of us don’t like changes or the unknown. Alexander is no different and he expresses what many children will relate to. I love that Alexander feels confident enough to let his family know what is bothering him. I love that Alexander’s vivid imagination finds so many inventive alternatives to his moving. I love that Alexander’s father comes up with a wonderful solution…buy a puppy who will accompany Alexander and his family on the move so that Alexander will have a ready-made friend to start his life in a new place. Any child will enjoy making this neighborhood map, but it can be especially helpful for kids who have just moved. Making this map will enable your child to feel more comfortable in this new and strange place…invite one or two of his or her new classmates to help (with special snacks after a job well-done) and you will be helping your child to develop new friendships. Children’s pretend play often reflects the real world. While they make a map of your neighborhood or their route to school, encourage language, math, and memory skills by asking thinking questions. 1. Use at least one piece of posterboard. If you use two or more, lay the pieces side-by-side, making sure the sides touch each other. Tape the pieces together with short strips of wide masking tape. Then cover the seam with a long strip of tape from top to bottom. You may want to tape the seam on both sides for a more durable map. 2. Cover a large work surface, such as the floor, with newspaper. Put the poster board onto the newspaper. 3. Now think about, plan ahead, and draw your neighborhood. Ask an adult for permission to take walks in the area to help remember details. Use Crayola® Crayons to add bright colors and cover large coloring areas. 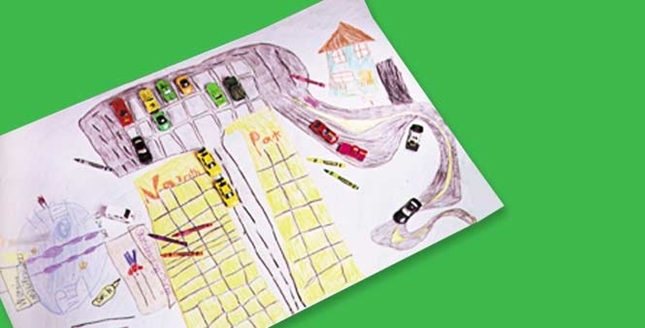 Crayola Erasable Colored Pencils work well to outline roads and buildings, label signs, and do detail work. And lots more map-making crafts here at artistshelpingkids. This entry was posted in children's picture books, Crafting with Children, Free Books for Libraries, Perfect Picture Book Friday, Reading with Children, Summer activities and tagged Alexander, Book review, Judith Viorst, Picture book by viviankirkfield. Bookmark the permalink. A book by Viorst about Alexander already gets two thumbs up from me, and it sounds like this one certainly deserves them. Great activity, too — I like the idea of kids making a map of their neighborhood, and getting some of the new classmates to help would enhance the experience so much, and help the child not only make new friends, but learn about the neighborhood from people who live there. Great addition to PPBF! We liked Alexander who has a very bad, terrible day, so I’m sure this book is excellent too. I could have used it a couple of years ago when we moved, although the kids didn’t mind the move at all. We moved within the same town, so it wasn’t much of a drastic change for them anyway. The Alexander books are so much fun…and kids really get it. 🙂 I’m glad your children adjusted to the move well…you are so upbeat, I’m sure that had a lot to do with it, Milka! Haha, it’s not that they had a choice anyway! But they got a backyard to play in and more room inside, so it was a welcome upgrade. Hi Marilou…I’m sure LSP will love making maps and passports (I’m sure she will have a REAL passport to travel in Europe 🙂 when the time comes. I’m so happy the books you find on my blog (and hopefully you visit Susanna’s Perfect Picture Book Page where you will find 100’s of other reviews and activities) are helpful. It can get overwhelming with all of the books that are out there…it’s nice to read an honest review and see related activities and website links. Vivian, this is wonderful! 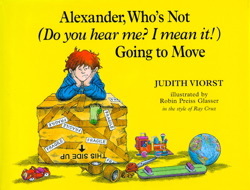 Sounds like a book Jackson would love (Alexander Who’s Not…Going to Move). His dad moved a few months ago, so Jackson’s home when he is with his dad is now very different. He still misses the old house… but he loves a few things about his new house (like his new baby brother). Anyway- the passport project is such a great idea- we’re going to do it! And I also Love Love Love the neighborhood map!!! I’ve not been around the blog world much in the past few weeks….. this made me smile this morning!! Blessings on your weekend! And on yours, Angela! Thanks for taking the time to stop by…and leave such a lovely comment. 🙂 Glad you liked the passport and map ideas…hope you and Jackson have a beautiful weekend! Hi Vivian! We worked on our passport tonight! We have some great ideas! We’re going to visit forests, caves, waterfalls, and maybe Lake Michigan… all within a few hours drive in our great Midwestern state! 🙂 Hope you had a lovely Memorial Day Weekend! Thanks again for your great inspirations! Wow, Angela! Sounds like it is going to be a fun-filled summer! So glad you are putting the “passport” idea into action. 🙂 I hope you and Jackson have a beautiful week! I hope all parents of small children who are moving see this post. GREAT ideas and resources to help with the transition. Thank you, Julie…I think map-making is such fun…and there are so many different types of maps you can make with kids…how about a pirate map for the many pirate books out there? I love the Alexander books, though haven’t read this one yet! So many kids find moving hard that this is super relevant. That map is priceless. Thanks for all the great links. Wow, two books about moving and being the “new kid” in one week. These are perfectly timed recommendations for summer. We moved often as children, often in the summer. While it was hard to make new friends, and I hated to leave the old ones, I do believe moving made me more resilient and able to easily meet new people. Sounds great and thanks for the passport idea! Your book compliments mine. My book is about once you’re there. “The New Girl… And Me” talks about a neighborhood map, too, as an activity the neighborhood kids can do for the new kid. Showing him all the hot spots and good places to visit. Not sure I mentioned it specifically though, right now. Poor Alexander has a rough go of things. But we all benefit. Thanks for sharing this gem. Wonderful ideas about helping a child transition to a new home and neighborhood, it can be such a traumatic experience. Thanks, Vivian! Your package arrived just moments ago! As soon as I finish reading through Show Me How, I’ll do a review. I’ll hold the library’s copy until it reopens from renovation. What a timely book since a lot of kids move during the summer. I love the Alexander trilogy. Thanks for posting! Thank you, Jake…I appreciate you stopping by and commenting! I absolutely love your graphics for Sunday Post: Door! Great selection. I really like your passport project too. This is such a great book and I haven’t read it to my class for a few years. Thanks for the reminder, Vivian! !